Be prepared to be amazed by all the features Mobile Mouse has to give you full control over your Mac or PC. You will simply not find another remote control app that offers the amount of control and ease of use that Mobile Mouse does. Multitouch trackpad with support for all OS X gestures and the ability to program individual gestures. Control your computer like magic with the motion of your hand using the in-air gyroscope mouse. Quit, run, and switch programs in your dock using the OS X style dock. Also shutdown and put your computer to sleep. Find and open files on your computer remotely using the file browser. Control all your media programs from one media remote. View album art and info for the song currently playing on your computer. Control your presentation while viewing the current slide and presenter notes. Includes presentation timer with vibrating alerts. Works with WIFI-Direct, Bluetooth, and USB to enable connections without a local area network. 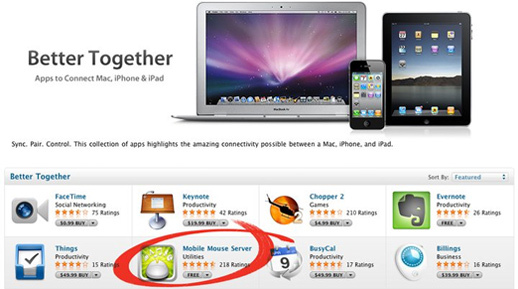 Mobile Mouse featured in Apple’s “Better Together” spotlight in the Mac App Store. Mobile Mouse featured in Lifehacker’s article about using your iPad as a remote. 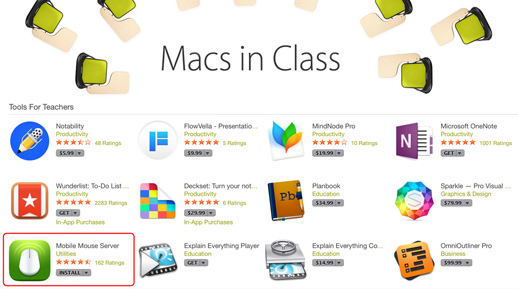 Mobile Mouse featured in Apple’s “Macs In Class” spotlight in the Mac App Store. Probably the most functional app I've ever purchased. Keyboards are customized for different computer operations and the air mouse is extremely precise, I'd give this ten stars if I could. Right out of the box. Fantastic. Had to restart after loading server software on the Mac.thank you! Using it for smart board in the classroom. There are few apps on my "indispensable" list. This is one of them. I use a MacMini as the hub of my entertainment system (driving a 1080p projector). This app works perfect to control it. Awesome .... Get it! I was skeptical at first but after trying the free version, I was sold. This mobile mouse the perfect mouse for me to control my media center! I've used this app for the last four or five years. There are very few apps I've consistently used over that timespan. My most frequent use is controlling my laptop from afar when I plug it into the TV. My screen on my MacBook Pro broke, so my way around it is I hook it up to my 50" TV and lay in bed with my phone. I can just watch movies or browse reddit just by relaxing in bed and using my phone as both a mouse and keyboard.